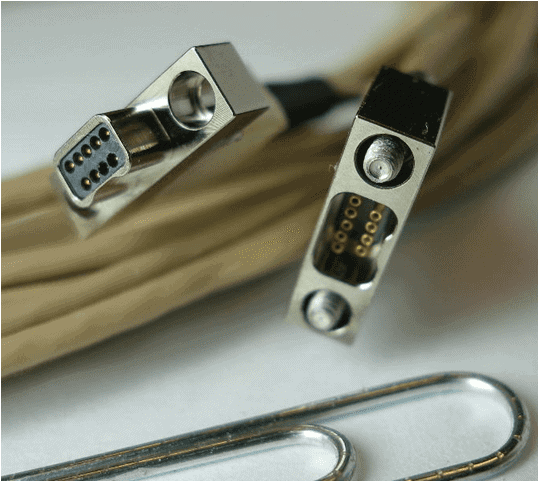 Ulti-Mate Connector, Inc. has released a complete line of .025 pitch “Nano” connectors designed and manufactured in accordance with MIL-DTL-32139. Contact arrangements from 9 through 65 positions are available. Termination options include stranded wire leads or PC tails for board mount applications. A key feature of the Ulti-Mate Connector nano connectors is a single piece flat tail crimpless contact for board mount applications. In addition to lower contact resistance, the integral tail design provides an industry-preferred flat geometry. The flat beryllium copper alloy tail provides increased surface area over the traditional round tail design for a more reliable solder joint. Another key feature and important distinction of the Ulti-Mate nano line of connectors is the available plastic shell, which, in addition to a lower price, also offers a significant weight reduction for applications where weight is a consideration.